Adipose tissue of an organism plays a major role in regulating physiologic and pathologic processes such as metabolism and immunity by producing and secreting a variety of bioactive molecules termed adipokines (reviewed in 1). One highly conserved family of adipokines is adiponectin/ACRP30 and its structural and functional paralogs, the C1q/tumor necrosis factor-related proteins (CTRPs) 1-7 (2). Unlike adiponectin, which is expressed exclusively by differentiated adipocytes, the CTRPs are are expressed in a wide variety of tissues (3). 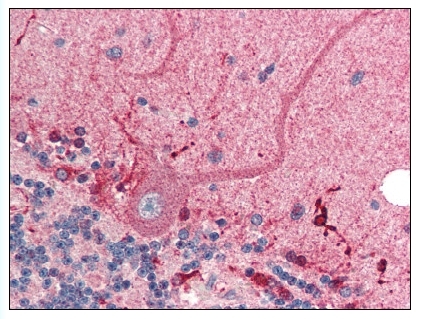 These proteins are thought to act mainly on liver and muscle tissue to control glucose and lipid metabolism. An analysis of the crystal structure of adiponectin revealed a structural and evolutionary link between TNF and C1q-containing proteins, suggesting that these proteins arose from a common ancestral innate immunity gene (4). Of the CTRPs, CTRP2 is most similar structurally and functionally to adiponectin. Recombinant CTRP2 rapidly activated AMPK and MAPK in cultured C2C12 cells, leading to increased glycogen accumulation and fatty acid oxidation (3). Western Blot analysis of C1QTNF2 expression in transfected 293T cell line by C1QTNF2 monoclonal antibody (M01), clone 1D7-2C7.Lane 1: C1QTNF2 transfected lysate(32.775 KDa).Lane 2: Non-transfected lysate. 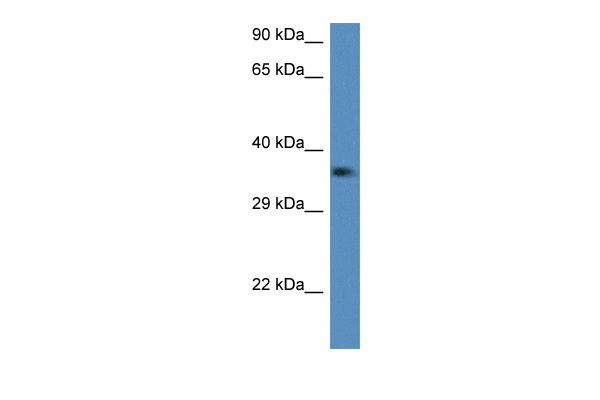 Western Blot analysis of C1QTNF2 expression in transfected 293T cell line (H00114898-T02) by C1QTNF2 MaxPab polyclonal antibody.Lane 1: C1QTNF2 transfected lysate(31.35 KDa).Lane 2: Non-transfected lysate. Western Blot analysis of C1QTNF2 expression in transfected 293T cell line (H00114898-T01) by C1QTNF2 MaxPab polyclonal antibody.Lane 1: C1QTNF2 transfected lysate(30.00 KDa).Lane 2: Non-transfected lysate. Immunohistochemical staining of human brain tissue using C1QTNF2 polyclonal antibody ( Cat # PAB13420 ) at 10 µg/ml. Western blot analysis of C1QTNF2 in NIH/3T3 ( Balb ) cell lysate with C1QTNF2 polyclonal antibody ( Cat # PAB13420 ) at ( A ) 1, ( B ) 2, and ( C ) 4 µg/ml. Western blot analysis of C1QTNF2 in Caco-2 cell lysate with C1QTNF2 polyclonal antibody ( Cat # PAB13421 ) at 1 µg/ml in either the ( A ) absence or ( B ) presence of blocking peptide. 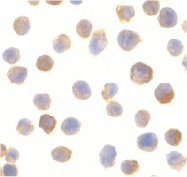 Immunocytochemistry of C1QTNF2 in Jurkat cells with C1QTNF2 polyclonal antibody ( Cat # PAB13427 ) at 10 µg/ml. Western blot of recombinant C1QTNF2 : ( A ) 5 ng, ( B ) 25 ng, and ( C ) 50 ng with C1QTNF2 polyclonal antibody ( Cat # PAB13427 ) at 1 µg/ml. 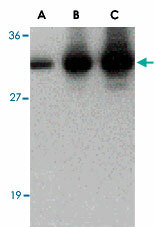 Western blot analysis of CTRP2 in 3T3 (Balb) cell lysate with CTRP2 (IN) antibody at (A) 1, (B) 2, and (C) 4 ug/ml. 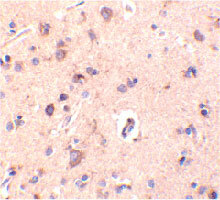 Immunohistochemical staining of human brain tissue using CTRP2 antibody at 10 ug/ml. 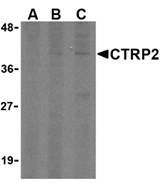 Western blot analysis of CTRP2 in Caco-2 cell lysate with CTRP2 antibody at 1 µg/ml in either the (A) absence or (B) presence of blocking peptide. Western blot of recombinant CTRP2: (A) 5 ng, (B) 25 ng, and (C) 50 ng with CTRP2 at 1 ug/mL. Immunofluorescence of CTRP2 in Jurkat cells with CTRP2 antibody at 20 ug/mL. Immunocytochemistry of CTRP2 in Jurkat cells with CTRP2 antibody at 10 ug/mL.